Kilcoe Castle: 10 Interesting Facts You Probably Didn't Know! Kilcoe Castle: 10 Interesting Facts We Bet You Didn't Know! If you want to see Kilcoe Castle, you'll first need to make your way to Cork County in the Province of Munster. From Dublin Airport, it's a four-hour drive to the southwestern tip of the Emerald Isle. Drivers should follow signs on the M7 south to Cork and then head west along the N22 and the R588. Once you get to Kilcoe, however, don't expect to knock on the door. Since it is a private residence surrounded by water, you'll only get to see the spectacular structure from the shores of the bay. 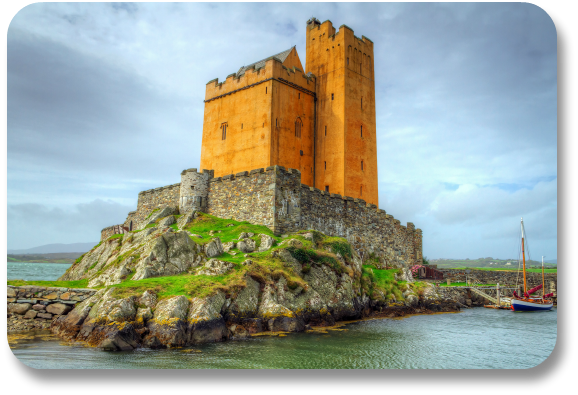 Situated on a two-acre island in the waters of Roaringwater Bay, County Cork, Kilcoe Castle was constructed in the 15th century by the Dermot MacCarthy clan. Although the structure is fascinating, what makes this castle so intriguing is its current owner: Famed actor Jeremy Irons. Even if you don't have an invite from Irons himself, you can see the castle from the shores of the bay, where it looks truly spectacular. In 1458, the McCarthy family of Ireland started construction on the Castle. For nearly 150 years, the castle thrived in West Cork. In 1600 and for several years afterward, battles raged at the Castle. The Irish residents fought long and hard to keep the castle out of English hands, but the attempts were futile. By 1603, after a long siege, the castle passed to the Crown Forces during the Battle of Kinsale. Famously, it was one of the last castles to withstand the English. Once in English hands, the castle was neglected. It wasn't long before it was in ruin. In 1978, a causeway was built to connect Kilcoe to the mainland. While this increased visits to the castle's exterior, the castle was still in ruin at this point. When the English actor Jeremy Irons saw the castle in 1998, he fell in love. He purchased the castle in its ruined state and began renovations right away. Kilcoe has been completely restored over the last two decades. However, Jeremy Irons has made some controversial changes. It just takes one glance to realize that the color of Kilcoe Castle is far from traditional. Instead of the usual castle hue, Kilcoe is painted a peach color. The Castle is a private residence, and tours are not available to the public. However, you can get a fantastic view from the land or from the sea, and there are plenty of opportunities for taking photos from the surrounding countryside. You can find more information on this interesting Irish landmark here.